Home > Blog > Mum’s gone to Sweden: Where’s Wallander? Mum’s gone to Sweden: Where’s Wallander? We were watching the new series of Wallander a few weeks prior to our trip, seeing Kenneth Branagh ferreting about with a non-too attractive white limb sticking up next to the shore. “Is that where we’re going?” Dougie asked, and continued to shake his head as we saw our gruff hero drive through the bleak, rainy countryside or stand, desolate, at the dark, ominous dockside. I had a lot of work to do to convince my family that Ystad would be a fabulous place in the summer. I was right. It was perfect. This is the beautiful Ystad, the gorgeous, flower-filled little town, with its tiny terraced houses, gladioli blooming at each front door. This must surely put a smile on Kurt’s face in the summer months. If the moody detective prefers the quirky and bizarre, I reckon he can’t improve on the medieval crucifix in the St Maria kyrka where the figure of Christ has a mop of actual human hair, donated by a well-meaning parishioner in the nineteenth century. Oh dear, not a good look. I’m afraid I was sniggering so much (God forgive me) that I neglected to take a photograph. This same church is the home of Ystad’s famous night watchman who sounds a bugle every 15 minutes from 9.15pm to 1am every night. A tradition that goes back to the 17th century, to warn the townspeople of threatening fire, the haunting sound is audible wherever you stay in the centre. You can’t see him, but if you look carefully you will see his horn appear in the openings in the tower walls. The bugle-blowing only stopped during World War II, though residents then complained that they couldn’t sleep because of the unbroken silence. Now it continues for the sake of tradition and if the night watchman does spot a fire, I gather he phones Emergency Services. We found a little gift shop selling local pottery and there were some special mini night buglers. We bought one as a souvenir, though Rory wasn’t exactly impressed and thought it looked like “a nun with an enormous spliff”. And how would you know what that looked like, young man….? LOL – laughing at the thought of our nuns! You never know! I watched my first ever Wallander the other day. Yawn! Can you imagine! We'll probably be struck down just for thinking it. I really liked to Wallander episodes we watched – I like the way he underplays the role, even umming and ahhing like normal people. I love Wallender too, especially the original one. It's somehow darker and more sombre when they speak in VO. I had to look up VO as I didn't know what you were talking about. Have learned something – Voice Over! Are these the Swedish ones or and older English version. Quite new to it myself. Oh, I didn't think – actually it means Version Originale, so we hear it in Swedish with subtitles. There's a Swedish version of the books which I've seen on ITV4 I think (or BBC4). That's what Kate thought, in the comment below! I hadn't a clue! I think we may have watched the same episode. An arm sticking out of the sand sounds familiar. I think I may have had to turn it off as too gruesome! Sweden looks amazing in Wallander (the Kenneth Branagh one – I haven't seen the original). I really like the style of the houses. It looks picture postcard pretty in your pictures! They are quite gruesome, aren't they. Far more than I'd expected. Sweden in general was a fabulous place and Ystad a real gem. I thought VO meant version originale – which means in the original language it was filmed. I love the Swedish version ones starring Krister Henrikssen – the first series of films is so good, much darker than the Branagh version, and so sad for lots of reasons I won't go into here. As you know, I would LOVE to go to Ystad. It looks amazing, although I would be going round saying "oh that's where such and such happened" from all the books and programmes! Heavens, there are two meanings for VO and I knew neither of them! I suspect Sarah meant your meaning, it would make sense. I thought of you a lot when we were walking round the town. You would have adored it, Kate. We watched Kenny in Wallander too – where's the fog and the rain? What fog? What rain? Wall to Wallander sunshine, Steve! I'm sure the bad wig will stay put until you next get to visit! It was a great choice and very near Malmo airport so although we flew to Stockholm, we flew back from Malmo – very easy. I'm looking at my little pottery watchman now in the kitchen, and I do have to laugh. So after 1am the threat of fire suddenly becomes my own problem. 1am. Lightweights. Either do a job properly or don't bother. Haha! Yup, you're on your own. In days gone by I'm sure he did stay up all night, in fact I read they could be flogged or even executed for sleeping on the job! Jesus with HUMAN HAIR on a crucifix?! I was so gobsmacked that I looked it up and found a photo… Not quite sure which comment I should make yet!! As for Kurt, I have read several of the books but never seen the series. 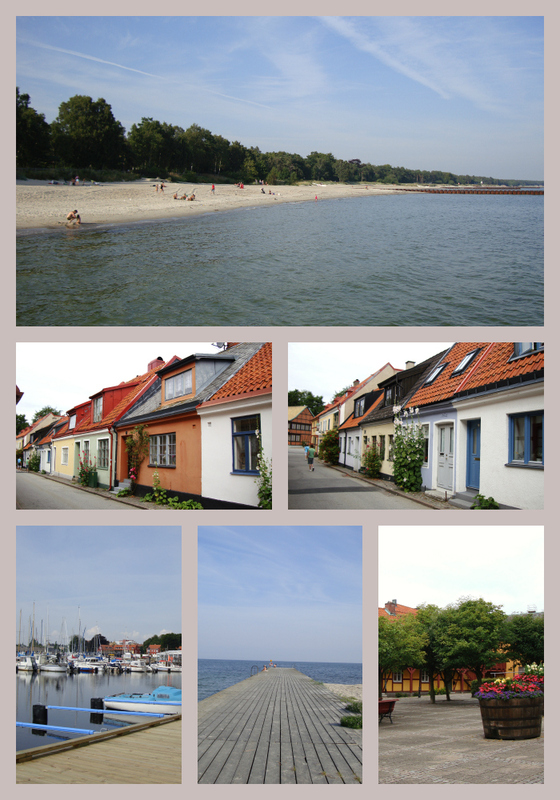 I do not recall a nice, sunny day in Ystad being described, so a good thing that you have these lovely photos as a proof! It's more than strange, isn't it. My guide book had mentioned it so I had to go and have a look as couldn't quite believe it. Nun with an enormous spliff – that's how they should market them, would be a sell-out! We met the woman who made them. She was a very sweet elderly lady. I'm sure she would have been quite put out by my son's interpretation. Though maybe, seeing as she had such a welcoming smile, she may have had a giggle. Oh it was so beautiful. A lilliputian town in some respects. Can't quite believe it's the same one in the gruesome thrillers we've watched. I think the bugling-every-15-minutes thing would have driven me insane, but the little souvenirs are cute, so I suppose it's all for the good. We probably would't have gone into the church on such a sunny day if I hadn'tread about the crucifix-I had to go and look, soi must be ghoulish too. I'm glad our hotel was out of town so we didn't hear it.